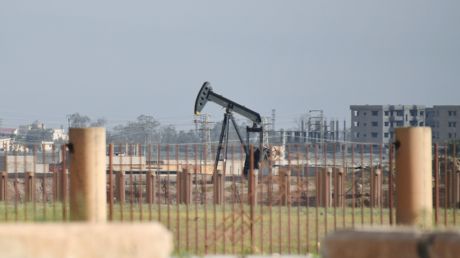 According to the Russian Defense Ministry, the Syrian militia unit was advancing against a “sleeper cell” of Islamic State (IS, formerly ISIS/ISIL) terrorists near the former oil processing plant of al-Isba, when it suddenly came under massive air strikes. At least 25 militiamen were injured in the attack, the Russian MoD noted, clarifying that pro-government troops targeted by the coalition did not coordinate their operation with the Russian command. The US, however, maintains that the militia attacked the SDF. The Pentagon said Syrian forces moved “in a battalion-sized unit formation, supported by artillery, tanks, multiple-launch rocket systems and mortars.” The battle which lasted over three hours, the US claims, began after 30 artillery tank rounds landed within 500 meters of the SDF unit’s location. “At the start of the unprovoked attack on Syrian Democratic Forces and coalition advisers, coalition aircraft, including F-22A Raptors and MQ-9B Reapers, were overhead providing protective overwatch, defensive counter air and [intelligence, surveillance and reconnaissance] support as they have 24/7 throughout the fight to defeat ISIS,” Air Forces Central Command spokesman Lt. Col. Damien Pickart told Military.com. Damascus called the attack a “war crime,” while the Russian military asserted that Washington’s true goal is to capture “economic assets” in Syria. The Russian Foreign Ministry spokeswoman Maria Zakharova affirmed that the US military presence in Syria poses a dangerous threat to the political process and territorial integrity of the country, while Foreign Minister Sergey Lavrov called the strike another violation of Syria’s sovereignty by the US. “They [US] constantly assert that they are fighting international terrorism there, but we see that they go beyond this framework,” Nebenzya told the UNSC. He warned the US-led coalition members that it is “criminal” to engage the only forces “who actually fight” international terrorism in Syria.